All new balconies, glass doors and windows throughout. Enjoy our home away from home located on the 6th floor, directly on the ocean. Relax in the ocean breeze while sitting on your private balcony listening to the sound of the waves. Swim in the ex-large heated swimming pool or bubble your troubles away in the jacuzzi overlooking the beach. Enjoy the sand and sun while taking a morning stroll or surfing the waves. Only steps away from the waters of the Atlantic, your vacation destination awaits. Whether participating in thrill rides, watching sail boats and dolphins or enjoying a moment of our nation's history, Daytona Beach offers something for everyone. Centrally located the condo is a short walk to the boardwalk and main-street pier where restaurants, rides, and movie theaters beckon. Beyond Daytona Beach, the condo is one hour from Disney World, Sea World & Universal. And even closer to the Kennedy Space Center and St. Augustine. Of course, the World famous Daytona Speedway is only four miles away. Our unit is privately owned and we take pride in providing guests with a quality stay. The condo has been newly renovated. It is fully equipped with a smart HD TV, cable, free WiFi, DVD, linens, towels and free parking. For your comfort, there is a full bed and fold-out (full size) sofa to sleep four comfortably. The kitchen is equipped with a range, microwave, refrigerator, coffee maker, blender, toaster, dishes, pots and pans. A wonderful vacation is waiting. MASTER CARD and VISA is accepted through PayPal or VRBO's payment system. 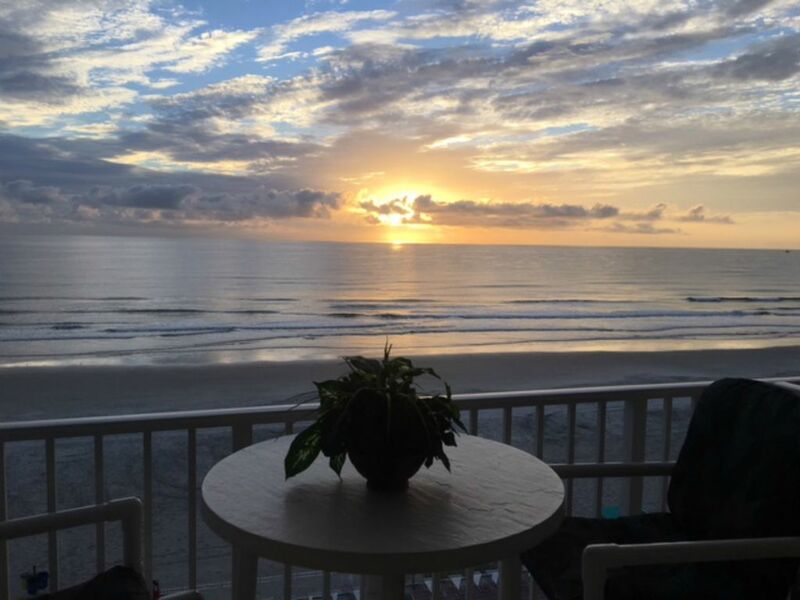 The best ocean -beach views and value in Daytona. It is fully equipped with a smart HD TV, cable, free WiFi, DVD, linens, towels and free parking. For your comfort, there is a full bed and fold-out (full size) sofa to sleep four comfortably. The kitchen is equipped with a range, microwave, refrigerator, coffee maker, blender, toaster, dishes, pots and pans. Everything you need for a wonderful vacation. Kitchenette, Ice Machine & Laundry, Gym, Jacuzzi, Large-Heated Pool overlooking Beach, private balcony with stunning view. We really enjoyed our stay in this lovely oceanfront condo. The condo was very clean, updated and just the right size for two people. The ocean views were spectacular from the 6th floor. The heated swimming pool and other amenities were great. Great location! Walking distance to several great restaurants. We will be back! A wongerful location for a relaxing vacation! For the two of us, this was the perfect place to spend a week in Daytona. We like to eat out occasionally, but we prefer to not eat restaurant meals daily The kitchen space permitted us this luxury quite adequately. As I told Richard, a small coffee table and a little extra light for eating and reading would have helped, but I believe these small additions will be made! Walking the beach and sitting by the pool were just right and what we do while escaping the "northern winter cold!" We hope to return!! Nice condo. Good security on premises. Been coming here for years, always an excellent experience, clean comfortable and the condo owner is a great guy and has always been very accommodating with anything we need. A $100 to $150 returnable damage deposit is requested when the reservation is made. Assuming no damages, the deposit is returned within two weeks of your departure. If you inform us of changes in your circumstances (before 4 weeks of your stay) the deposit may be transferred for another date. Sorry, no cash refunds will be given for cancellations.